The Robert L. Bogomolny Library and the University of Baltimore are thrilled to be chosen as 1 of 79 institutions, nationally, to receive a $15,000 grant from the National Endowment of the Arts to fund an NEA Big Read Program. The NEA Big Read is a reading initiative built around a particular book. UB’s selected book is Claudia Rankine’s Citizen: An American Lyric, which explores themes of racism endured by African Americans in the US and what it means to be a citizen. The University of Baltimore has secured funding for Claudia Rankine’s visit and venue reservations, but we need your help in purchasing 450 print copies of Citizen: An American Lyric. These will be distributed to the public via the Enoch Pratt Library system and to UB students, staff, and faculty via on-campus events. This book was chosen to encourage discussion rooted in critical thinking and empathy. A campus- and city-wide conversation on issues of inequality and social justice will emphasize that knowledge, understanding, and communication are catalysts for change. 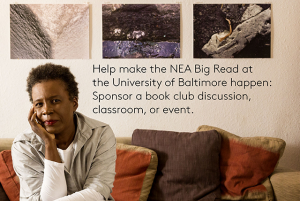 The NEA Big Read is designed to encourage reading, book discussion, and collaboration between community organizations. Programming is scheduled between February and March of this upcoming spring and will include oral history interviews, creative writing workshops and readings, art installations, and a movie viewing. The programming will culminate in a two-day event, which combines a campus visit by the book’s author, Claudia Rankine, and an art exhibition titled “I am a Citizen” at the American Visionary Arts Museum. Claudia Rankine will visit the UB campus for a private workshop and a public reading and interview with Mark Steiner. Please help us connect Baltimore citizens through the joy of reading and conversation. Make a gift and tell others about the Big Read Book Drive today! This entry was posted in Uncategorized by Amanda May. Bookmark the permalink.